Foreigner have announced more reunion shows following an August 4 concert at Sturgis Buffalo Chip in Sturgis, SD that featured members of both the current lineup and original band. 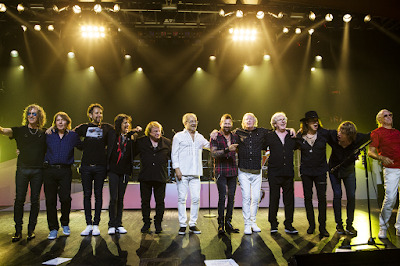 At the end of their set at Sturgis, singers Gramm and Kelly Hansen took center stage to announce a series of four more fall reunion concerts; billed as “Foreigner presents Double Vision: Then and Now”, the group will play a pair of dates in California and two on the east coast. “It’s great to see everybody, who you haven’t seen, in some cases, for a long, long time,” Jones tells Forbes about the spirit of the reunion shows. “From time to time the guys come up on stage, wherever we are, it doesn’t matter, somewhere in the world somebody will be there and we’ll get them to the show. They’ll sit in and it’s just a really cool atmosphere and there are no big problems with anybody, as far as I know (laughs). Tickets for the fall dates will go on sale later this week, as listed below. The reunion show announcements come on the heels of the 40th Anniversary of Foreigner’s best-selling album, 1979’s “Double Vision”, and news that the band is working on a special release to celebrate the occasion.